Here is a MacBook Air doesn't boot, the problem is the capacitor on the motherboard is damaged, which causes problems with the motherboard power supply, and eventually causing the MacBook Air to fail to boot, how to troubleshoot it? The MacBook model is A1466, the motherboard model is 820-00165-A. Firstly, we need to test the MacBook Air. Connect the MacBook Air to the power supply, the green light lights up normally. Then press the MacBook power button, the MacBook doesn't boot. Use screwdriver to remove the MacBook rear case, disconnect the MacBook battery. Connect the MacBook to the DC power supply, we can see that the current stuck at 0.037. Log in to ZXW online account to check MacBook Air schematic diagram and bitmap. Remove the MacBook motherboard, use digital multimeter to measure the voltage for the L7130 inductor, the voltage measured is 8.5V, it's normal. Next to find out the standby voltage 3.3V inductor, it's L7560. 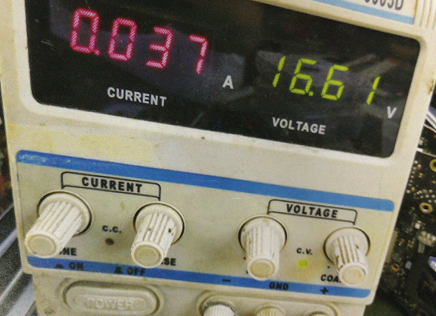 Use digital multimeter to measure the voltage for the inductor L7560, the voltage measured is 0.56V, which is abnormal. The standby 3.3V voltage output is abnormal; we need to check the working condition for the standby power supply chip. Check the working conditions of the U7501 chip, measuring the main power supply 23 Pin VIN voltage, the voltage measured is 0V. According to the MacBook schematic diagram, we know that the PPBUS_S5_HS_OTHER_ISNS is connected to the PPBUS_G3H through by resistor R5430. Find the resistor R5430 on the bitmap, and then use digital multimeter to measure the voltage for the resistor R5430 2 Pin PPBUS_G3H, there is no voltage, the pubic point has no voltage. The charging inductor that was initially measured has voltage, now go back to the charging inductor output side. Measuring the voltage for the 2 Pin of the insurance F7140, the voltage measured is 0V. Disconnect the power supply, and then use digital multimeter to measure the grounding resistance of the 2 Pin, the value is 0ohm, it's short-circuited, which means the rear pole output is short-circuited. Measuring the grounding resistance for the 1 Pin of the insurance F7140, the value measured is 111ohm, it's normal. Measuring the insurance, it's infinitely large, which is damaged. External connect a voltage to the 2 Pin of the insurance F7140, the external voltage can't exceed the voltage of the inductor output 8.5V. External connect the DC power supply, and adjust the voltage to around 2V. When the current up to 3.7A, touch the motherboard with hand to check if there are chips or capacitors on the motherboard is overheat. When touch the capacitors that next to the CPU, this capacitor is overheated. 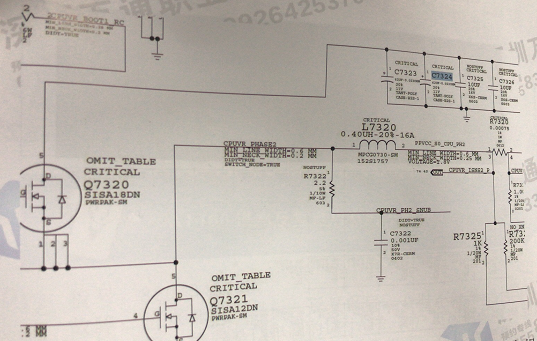 Check MacBook schematic diagram and bitmap, we know this is C7324 capacitor. The C7324 capacitor is the filter capacitor on the upper tube main power supply of the CPU core power supply, the damaged capacitor caused main power supply is shorted and no output. Replace the new capacitor C7324 by QUICK 861DW hot air rework station, after replacement, the grounding resistance value of the PPBUS_G3H measured is normal. Replace the insurance F7140, and then connect the MacBook to the DC power supply, the current jumps normally. Finally, assemble the MacBook Air, press the power button, now the MacBook is turned on successfully. The trouble has been solved!